Providing services to 122 countries and being the fastest growing air cargo brand worldwide, Turkish Cargo carried the wild animals, known as the most predatory species of the wildlife, over the clouds. 4 tigers, 3 lions, 3 cheetahs, 2 lynxes and 1 cougar were transported safely to Istanbul from Prague as part of the special cargo services. Showing utmost care for live animal transportation service and creating real-like natural habitats on the skies, Turkish Cargo achieved to transport the live animals, taken from Biopark ŠTÍT wildlife support and breeding facility in Czechia, to Istanbul. 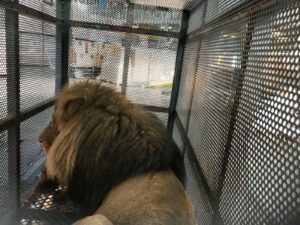 The predators were accompanied by their keepers, specially-assigned veterinarians and IATA LAR (IATA Live Animals Regulations) certificated Turkish Cargo personnel during the flight. By ratifying the “United For Wildlife (Buckingham Palace) Declaration (UFW)” in 2017 for the purpose of preventing illegal wildlife trade and increasing the industrial awareness thereto, Turkish Airlines has highlighted its cognizance of the live animal transportation processes and animal rights. For the purpose of performance of the live animal transportation service, it offers to its customers, Turkish Cargo carries out its such operations as based on the IATA LAR during the course of its acceptance, storage and shipment processes, and it meticulously implements the documentation, encaging, labeling and marking guidelines as described under the said regulations.